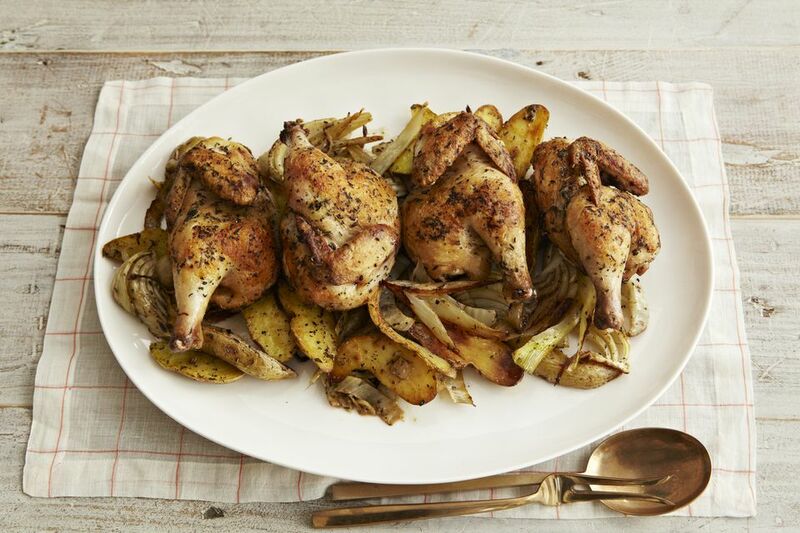 Whole basil leaves, butter, and herbs tucked under the skin of these Cornish game hens make them delicious and colorful. If you have prepared pesto, feel free to replace the herb butter with it. One whole Cornish game hen will yield approximately 6 to 8 ounces of meat. Allow one small hen per person. Line a large baking sheet or roasting pan with foil. Place a rack in the pan and spray it with nonstick cooking spray. Season the inside cavities of the Cornish game hens with kosher salt and black pepper and arrange them on the rack in the baking dish. In a small bowl, mix the butter with the chopped herbs. With your fingers, loosen some skin on the top and sides of the game hens. Or use the blunt end of a wooden spoon. Push small amounts of butter mixture under the skin of the breasts. Tuck a few thin slices of garlic under the skin of each breast. Carefully slide one small whole basil leaf under the skin of each breast. Pat any remaining butter over the outside of the hens and then sprinkle them lightly with kosher salt and freshly ground black pepper. Roast the Cornish game hens for 1 hour, or until they are golden brown and the juices run clear. The minimum safe temperature for poultry is 165 F. Check the temperature with an oven probe or instant-read thermometer inserted into the meaty part of the thigh, not touching bone. To make it a full meal, toss about 1 1/2 pounds of sliced potatoes with a few tablespoons of olive oil and extra chopped herbs and arrange them in the baking dish around the hens. Replace the butter and chopped fresh herbs with prepared pesto. Rub it under the skin and then tuck the garlic under the skin.